(CNN) -- Costa Rican President Oscar Arias presented an updated proposal to end the Honduran political crisis, but its adoption seemed unlikely, as one side described the talks as "failed" and the other asked for more time. Honduras' ousted President Manuel Zelaya answers questions in Managua, Nicaragua, on Sunday. The document, dubbed the San Jose Accord, calls for ousted President Jose Manuel Zelaya's return to power, the creation of a unity government and early elections. The accord is very similar to an original plan suggested by Arias but with more details and a creation of a truth commission to investigate the events that led to the crisis. It also includes a timeline for its implementation, which could have Zelaya back in Honduras by Friday. Arias signaled that his latest effort as mediator after two unsuccessful rounds of talks was also his final. Zelaya and his successor, interim Honduran President Roberto Micheletti, can turn to other forms for negotiations if they cannot agree to the deal, Arias said. Arias read the proposal on Wednesday at a news conference in San Jose, Costa Rica, flanked by Zelaya and Micheletti's delegations. Responses from the two camps following Arias announcement gave slim hope that the accord would be signed. "(The talks) failed because of the intransigence of the coup regime," she said. For Micheletti's side, Mauricio Villegas said his camp would present the San Jose Accord to the three branches of government for their approval, which would be necessary before moving forward. Earlier this week, another Micheletti negotiator said that the supreme court had already signaled that it would not accept Zelaya's return as president. "We must make way for peace and democracy, because the alternative is a cliff where even bigger trouble than we know awaits," said Arias, who had been serving as mediator between the two sides. "So today I ask you respectfully, but with urgency, to carefully review this document and reflect on it." Earlier, Micheletti had offered a counterproposal, Honduras's foreign minister, Carlos Lopez Contreras, told CNN affiliate Televicentro. Sources close to Micheletti's delegation told CNN that the counterproposal would have given amnesty to Zelaya and allowed him to return. But the nation's Supreme Court, which supports the coup and insists Zelaya must be held responsible for allegedly trying to subvert the constitution, rejected the amnesty provision, the sources said. Negotiations had stalled over Arias' proposal that Zelaya be reinstated. 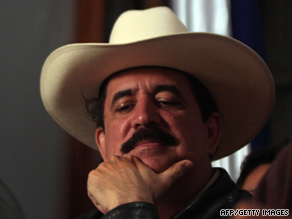 Zelaya was going to hold a referendum that could have led to changing the Honduras Constitution, even though Congress had outlawed the vote and the Supreme Court ruled it illegal. Zelaya was deposed June 28, the day the vote was supposed to be held, in a military-led coup and replaced by congressional leader Micheletti a few hours later. Micheletti's counterproposal would have instituted a six-month moratorium on legal action against either side. In another development, Honduras gave Venezuela's diplomats 72 hours to leave the country Tuesday on the grounds that leftist Venezuelan President Hugo Chavez has been making threats against the provisional government. Venezuela called the expulsion order "absurd" and said it will not comply because it does not recognize Micheletti's government. Chavez and Zelaya are political allies. The coup has drawn international condemnation, including demands by the U.N. General Assembly and Organization of American States that Zelaya be reinstated. The European Union and United States also have curtailed some aid. Micheletti has steadfastly refused, saying Zelaya's removal was a constitutional transfer of power, not a coup.